In 2007, Mary Eldergill, a volunteer member of Amigos de Los Animales (Friends of the Animals), discovered a group of newborn puppies on Dead Dog Beach in Puerto Rico. Mary rescued and rehabilitated them and, three months later, they flew to Newark, New Jersey, to be placed in their forever homes. Jean Baur and her husband adopted one of Mary’s rescuesa dog named Bellaand opened her Pennsylvania home to her new best friend. 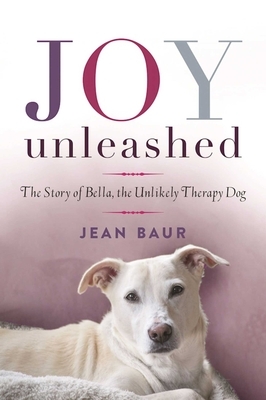 Just as Jean enrolled Bella in certified therapy-dog classes, she lost her job at the age of sixty-five. This new work, visiting hospital patients with her therapy job, gave Jean hope and a new purpose in life. After moving to Connecticut, Bella’s work expanded to nursing homes and elementary schools, as well as local hospitals and cancer centers. She met an Alzheimer’s patient who learned to smile again after Bella took a treat from her hand. She also befriended a six-year-old boy with autism (who previously held a deep fear of dogs) along with a disabled hospital patient who was withdrawn and uncommunicative until Bella jumped into the bed with him and coaxed him to open up again. Jean and Bella’s journey into the world of therapy-dog work gave them a bright, new outlookand has helped countless others overcome their own struggleswhile proving to all that broken souls can, indeed, be healed. Joy Unleashed is a must-read for anyone who appreciates the true power of the human-canine bond. Jean Baur has published widely in both fiction and nonfiction, and is known for her keen observations, humor and direct style. Jean is a dynamic speaker and a member of the National Speakers Association, and Bella is very well behaved. Jean and Bella reside in Stonington, Connecticut. Aimee Scott is a special education teacher with twenty years experience. She teaches at LEARN's intensive program in Old Lyme, Connecticut, and is known for her ability to connect with students with special needs. She loves her "cherubs." She and Jean and Bella worked together at Deans Mill School, Stonington, Connecticut, and Aimee resides in Waterford.